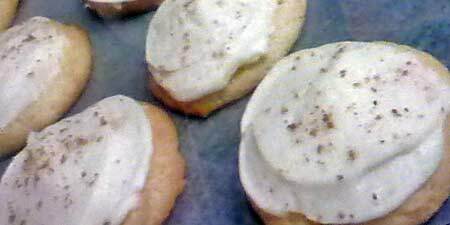 If you love eggnog, then you'll love this easy recipe for EggNog Cookies. They are the perfect treat to share with friends and family this holiday season. Egg Nog is a popular sweetened frothy and custardy holiday beverage in North America. Traditionally, it is made with milk, sugar, and beaten eggs and lightly flavored with vanilla and nutmeg. You can enjoy eggnog by itself, with a small addition of brandy, rum or whisky, and topped with a cinnamon or nutmeg sprinkle. You may also find eggnog as a favorite holiday flavoring in teas, coffees, ice cream and custard. Enjoy these holiday cookies with coffee, tea, hot spiced cider or, best of all, more eggnog. In a mixing bowl, beat butter and sugar until fluffy. Add EggNog, baking soda and nutmeg and mix well. Gradually add in flour and mix until well combined. Divide dough into fourths (individually wrapped in plastic wrap) and chill overnight in refrigerator or for 2 hours in freezer. 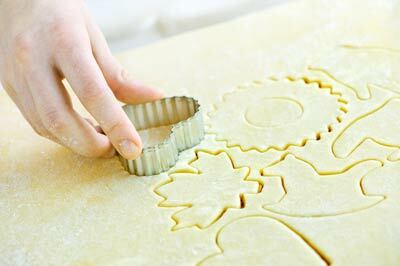 On well-floured surface, roll out cookie dough (one-fourth at a time), to 1/8-inch thickness and cut with floured cookie cutters. Reroll as necessary to use all dough. Place cookies about 1 inch apart on ungreased baking sheets. Remove and place cookies on wire racks to cool completely. Ice and decorate with EggNog Icing if desired. Using an electric mixer, beat 3 cups sifted powdered sugar and 1/4 cup softened butter until well mixed. Gradually beat in 1/3 cup EggNog until icing is smooth. This recipe makes about 8 dozen EggNog Cookies (depending on size and shape of the cookie cutter used). This recipe will make frosted eggnog cookies but it's easy enough for you to turn them into sandwich cookies if you prefer. Instead of frosting the cookie tops, just put some frosting on the bottoms of the cookies and match them together. Sift together flour, baking powder, salt, cinnamon and nutmeg and set aside. In a mixing bowl, beat butter and sugar together until fluffy, about 2 minutes. Add egg yolks, one at a time, beating after each addition. Add eggnog, vanilla and rum and beat until combined (mixture may look a little lumpy but that's ok). Gradually add in sifted flour mixture, beating on low until just combined. Drop dough by rounded tablespoons about 2 inches apart, onto parchment-lined (or silpat-lined) cookie sheets. Bake until bottoms are lightly golden, about 10 to 12 minutes. Remove from oven and transfer cookies to wire racks to cool completely. Beat butter and cream cheese until well combined. Add the powdered sugar and beat slowly until incorporated. Add rum, lemon juice and dash of salt and continue beating on medium-high until icing becomes fluffy and spreadable. Frost top of each cookie with about 1 1/2 teaspoons of icing. If desired, grate fresh nutmeg over icing. This recipe makes about 4 1/2 dozen Drop Eggnog Cookies.